Comparing different web sites running the same ASP.Net application, my idea was to use JMeter to perform a couple of requests and display the execution times for the requests per site. The test plan has a Thread Group which defines how often a sequence of steps is performed, and how many threads are used to execute the sequence. 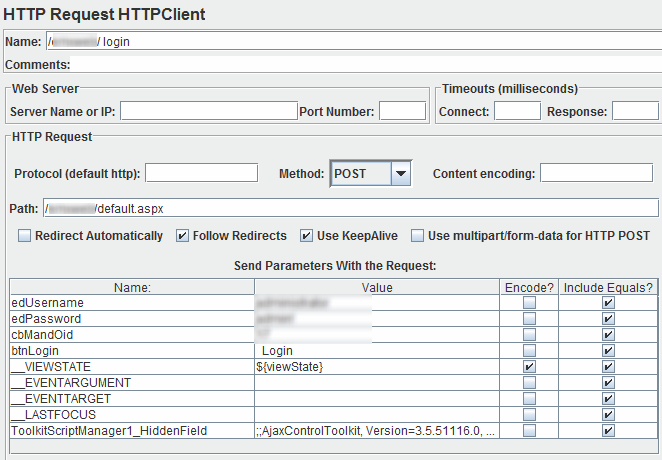 Use a HTTP Request Defaults configuration element to define server name, port number and other connection parameters. 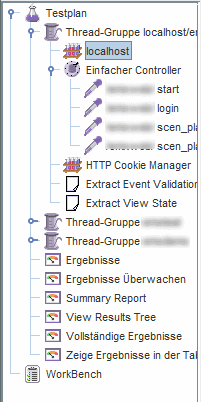 Under the Simple Controller (under Logic Controllers) to contain the sequence of steps, consisting of HTTP Request or HTTP Request HTTPClient elements (under the Samplers menu). Each of them contains the URL Path (everything after the host name) and optionally a couple of parameters. Next, add a couple of Listeners, such as Summary Report, View Results Tree and View Results in Table to display the requests’ performance data. While this would be sufficient for non-ASP.Net web sites, ASP.Net requires a couple more elements. First, the HTTP Cookie Manager is required to store the ASP.Net session cookie. Simply add it as config element. Next, the various hidden variables of ASP.Net need to be parsed and posted. For example, a POST requires that the __VIEWSTATE variable is posted as well, otherwise ASP.Net would not be able to perform its magic. If you use the Ajax Control Toolkit, you may also need to pass the ScriptManager’s hidden value. Hit F12 in your browser, enable request logging (Net, All in Firefox; Network in Chrome), and find the posted value in the Request data. Thanks to the pages that helped me with the information I needed: Technically Works, and a couple of answers on StackOverflow. This entry was posted on Thursday, July 12th, 2012 at 0:27 and is filed under ASP.Net, JMeter, Web Testing. You can follow any responses to this entry through the RSS 2.0 feed. You can leave a response, or trackback from your own site. ASP.NET Enterprise applications are often protected with Basic, NTLM or Kerberos Authentication so I guess that using HTTP Authorization Manager to bypass authentication challenge should also be highlighted. See Windows Authentication with Apache JMeter guide for detailed walkthrough on handling above authentication types in JMeter.